We keep most junk around for economic reasons: because we think we’ll use it, because we think we’ll need it, because we can’t accept a sunk cost or because we can afford to buy knick-knacks of no value. The last breed of junk, however, isn’t economic; it’s emotional. I should begin by noting that I am nothing if not a bibliophile, a lover of literature and the limitless knowledge and entertainment books contain. But loving literature is not the same as loving books. I have great friends with lovely libraries, cabinets and cases of texts and tomes, paperbacks and publications, hundreds and hundreds of bindings containing thousands and thousands of pages. It’s beautiful wall art. But is it functional? Hardly. Think of all the books you’ve ever read. If you have a library, think of how many books you own. Now think of how many of those books you’ve read a second time. Some? A third time. A few? A fourth time. Maybe two, one, zero? Practically, personal libraries are overwhelmingly underused: a book purchased, read, and then shelved, never to be opened again. With over 130 million different titles in existence, the reader rarely returns to her collection. Rather, she adds to it—buy, read, shelf, repeat—and the library grows. Many books, lots of space. So what’s the harm? Space, for one—libraries take up a lot of room and are a pain to move. Finances—buying books costs money. And then there’s the environmental cost: books are, well, made from trees, and every new copy of a book requires new pages, new trees. My simple back-of-the-napkin estimate of Dickens’s A Tale of Two Cities, for instance (200 million copies at an average of 500 pages each, with a single sixty-foot pine tree yielding about 80,000 pages), has required nearly 1.3 million trees to produce over its long print-cycle—about 3% of the Amazon’s (the forest, not the retailer) present inventory. And remember, that’s just the impact of one (very high-selling) book. But space and money and planet aside, perhaps the best argument for ditching the library is sharing. As with just-in-case junk (for what is a library but just-in-case-I-want-to-read-this-later junk? ), everything we have is something someone else can’t have. When we hoard five hundred books just in case we want to reread five, we’re keeping 495 books from our community, 495 books that can be read not later, but now—right now. And let’s face it: if we care about a book enough to keep it, isn’t it inherently something we think others deserve to experience as well? 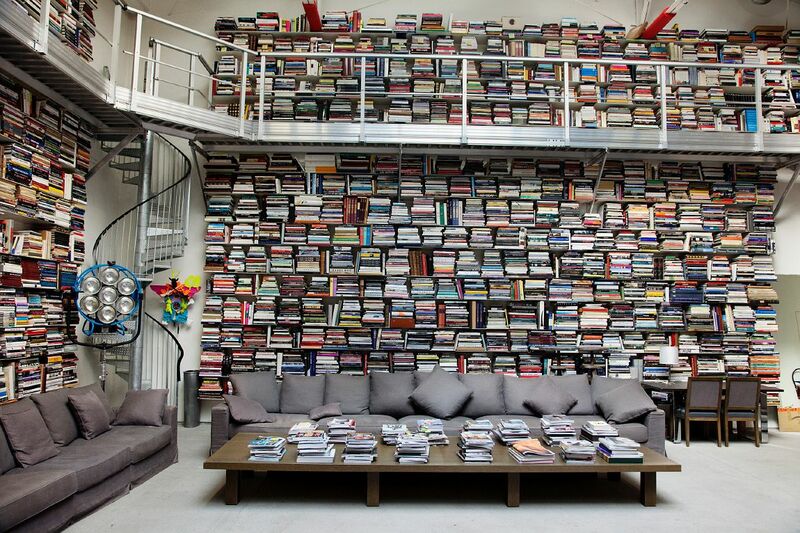 But how do we go about reading without amassing a library? Simple. We begin by donating our books—all those but the few we really, really, really believe we’ll read again—to real libraries, public libraries, libraries with free and open access to all. Or we build a little free library in our neighborhood and stock it with our best. Or we pass on our collection to a used books store, perhaps even sell them on Amazon (the retailer, not the forest) for a fair price. We keep the revolving door revolving. It’s light. At under 8 ounces, an e-reader weighs half of an average paperback, and that weight doesn’t change for the epic novels. Infinite Jest and Cannery Row not only weigh the same, they weigh the same together—8 ounces on a Kindle, 2 pounds in hand. For travelers, e-readers are phenomenal; one can easily pack 100 books for a multi-month excursion, and stuff the whole collection right into their back pocket. It’s … light. Speaking just for the Paperwhite here, it’s an absolute pleasure to read in the dark. With a soft, adjustable backlight that’s easy on the eyes, reading lamps, flashlights, and strained lenses are a thing of the past. Books are affordable and available for all. With thousands of titles in the public domain—and many more free to download if you know where to look—e-readers have the potential to truly close the literary gap between the advantaged and the disadvantaged. Growing up with neither the money for books nor someone to take me to the library regularly, it’s heartening to see such open access to literature growing and evolving, but it depends on the support of all of us to continue doing so. Of course, I’ve heard the arguments against them—but I love the feel of a book!, they smell so good!, or the entitled and illogical ramblings of Jonathan Franzen—and for a while, I believed them too (maybe not the Franzen bit). But the truth is, first you try an e-reader, then you get used to an e-reader, and then you prefer an e-reader, and the bookworm inside of you thanks you for it. The minimalist in you does too. I won’t ridicule sentimental junk as I have junk’s other five forms, for our sentimental items are often those we’re most sensitive about. We give them value that transcends currency; often, we consider them irreplaceable. These treasured bits of ​our very selves adorn our home and warm our hearts—the very type of thing I’ve advocated for keeping around in the past—so I want to be clear that what I’m talking about here is not the urn or the photo album, nor the old rocking chair passed down through the generations. Sure, these are sentimental, but they are not sentimental junk. Sentimental junk are those items we keep because we feel they should have value. Old holiday cards with more matter than message, ticket stubs we plan to scrapbook one day but never do, letters from lovers long gone, a final draft of a senior thesis or a diploma itself. In my own downsizing journey, these were the most difficult items to part with. But after the hesitance, recycling my diplomas and burning old correspondence felt cathartic, freeing, leaving my past alive in the only place it really exists and the only place it can be truly treasured: my memories. And then, of course, there’s digitization. Yes, we can burn our letters and toss our photo albums and discard our physical encumbrances, but that needn’t be our only option. For we live in the digital age, an age of uploading and archiving, an age when the contents of a shoebox or a trunk can be preserved on a chip smaller than a fingernail. Perhaps flipping through digital albums isn’t quite the same as passing an afternoon in the attic perusing old photobooks, but hey: at least you don’t need an attic. This post is the fourth of a series on living simply. More to come soon. As much as I want to quarrel with you because I love having books around, I do agree that a lot of the books we own would be much better suited to sharing. I would counter, however, that nonfiction and reference books probably get more second, third, fourth looks than novels. I reread my novels occasionally, but I’m far more likely to pull out a cookbook dozens of times or a book of poetry. More reason to keep these types around I’d say. Fair enough. Pulling up nonfiction on the Kindle is nice because it’s very easy to search by word or highlight, but yeah, cookbooks are definitely a good thing to have around (and probably the most sizable portion of my [greatly reduced] physical book collection). I love paperbackswap.com for just this reason. My “library” is a rotation of new-to-me books, and I’m able to find some obscure ones my public library doesn’t have. Hadn’t heard of paperbackswap.com, but what a great concept! Totally agree and my library is pretty much gone beyond current reading materials I can’t get digital. Plus they weight a ton and load you down if traveling. As for the digitizing of things that is a great idea. And for all the pictures you take digitally load them all on a SD card and hang a Digital Picture Frame that you set to slide show and every time you see it a different picture is there to remember.